I'm sure you are familiar with the phenomenon of someone telling you not to do or think about a certain thing, and immediately you are tempted to do or think exactly what you've been told not to. You reach out to touch the wet paint, read the forbidden book, let your thoughts wander into off-limits territory. The best way to avoid such knee-jerk straying is to focus on what you should do, not what you shouldn't. "The design of the Holy Spirit as He develops in us fruit characteristic of the "divine nature" (vv. 22-23, 2 Peter 1:2-8), is to constrain us toward a life in which the tendencies of the flesh are both undesirable and unproductive…. The Holy Spirit both monitors and empowers, enabling practical godliness. Discernment on our part teaches that some sins are driven by carnal nature (flesh) and others by carnal nurture (nourishment), depending on the way one is fed or bred. Some sins are avoided because of divine prohibitions and others by divine (Holy Spirit) inhibitions when the indwelling Spirit brings the Word, or personal warnings to mind. Growth in Christ increases resistance to all that is uncharacteristic of Him. We become more internally motivated as our hearts learn to inhibit disobedience instead of relying on our minds to memorize rules and wrestle to obey. Learning to "walk in the Spirit" will bring a gradual movement from mental rules and disciplines to an obedience rooted in the heart's judgments and convictions." - Jack Hayford, "Walk in the Spirit" from New Spirit Filled Life Bible , p. 1637. 1. Abide in a right relationship with Jesus (Galatians 5:25). 2. Understand our true strength is found in weakness (2 Corinthians 12:10). *Above three insights from Kenneth C. Ulmer, "Growth Inhibitor #3: The Flesh" - New Spirit Filled Life Bible , p. 1637. Sounds great. Now to live it! PRAYER: Dear God, please help me to put all this great theory into practice. I long for the fruit of love, joy, peace, long-suffering, kindness, goodness, faithfulness, gentleness, and self-control in my life. Amen. Tug-of-war is an ancient game of strength. It pits two teams against each other as they pull in opposite directions on the same rope. The team that pulls the rope and the other team over a predetermined mark on the ground, wins. I found a forum page on which people volunteer their strategies for winning a tug-of-war competition. Though there is no lack of conflicting advice ("I'd say big guys in the back" versus "it's better to put your strongest people in the front") some strategies are instructive in helping us live the Christian life. 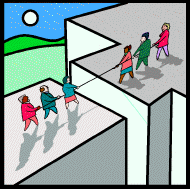 "All pull hard at once" - Give resisting temptation your best effort right from the start (Proverbs 4:14). "Most important thing is to keep leaning back." - Don't even make the first motion toward giving in (Daniel 1:8 versus 1 Kings 11:1,4). "Maximize the amount of time your feet are on the ground" - Don't lose focus, even for a moment (Romans 6:13). "Little tricks are the best. Tell your team ahead of time that if the other team says "1,2,3,pull," you will pull on their 2 or 3. They won't be ready because they were preparing to attack." - Be aware of the sneakiness of your own human nature and use that awareness to work in your favor (James 1:12-15). "Get a synchronized jerking motion so that everyone on the team is pulling at once" and "Get low, lean back, and dig in. Tug of war is almost all in the legs." - Know your weapons (Ephesians 6:10-18). "Pull your pants down" and "Pull the other team's pants down" - Umm, yep, well, I'm thinking distraction might be a good tactic. Like distracting yourself from the allure of the temptation by planning an escape route (1 Corinthians 10:13).